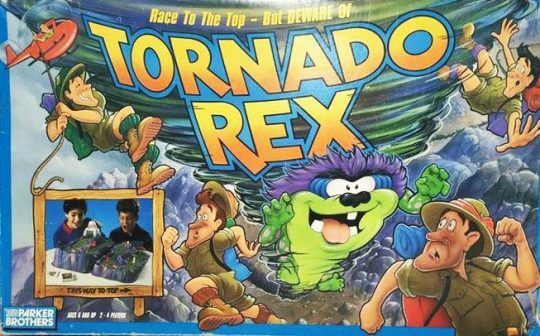 Similar to Fireball Island, Tornado Rex is a 3D action game where players try to be the first to get their two hikers to the top of the mountain. Players draw a card to determine what kind of move they can make (forward, backward, switch places, etc.). The cards also determine when Tornado Rex is released: a spinning top that careens down the mountain trail knocking off any hiker he happens to hit.